First cut a 6" x 9 1/2" piece of Stampin' Up! Tip Top Taupe card stock and fold it in half for the base, a 4 5/8" x 5 7/8" piece of Stampin' Up! Pool Party for the middle layer, a 4 1/2" x 5 3/4" piece of white for the front layer, a 1 1/4" x 4 5/8" piece of Tip Top Taupe for the strip, a 3 1/4" x 4" piece of Pool Party for the image background and a 3" x 3 3/4" piece of white for the image. 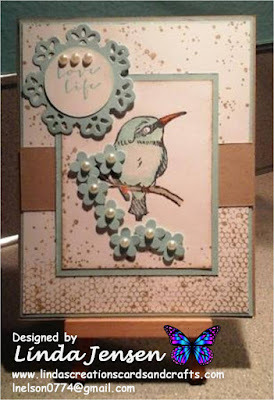 Next create the background with stamps from Butterfly Basics and Gorgeous Grunge stamp sets in Stampin' Up! Crumb Cake ink and attach the Tip Top Taupe strip. Then stamp the bird with black Stazon Jet Black ink, color it using an aqua painter with Stampin' Up! Soft Sky and Pumpkin Pie inks, attach it to it's Pool Party background then to the front layer. Then cut out the sentiment's background with a Spellbinders Floral Doily Motifs die. Next on a white circle die cut, stamp the sentiment in Soft Sky ink, attach the self-adhesive pearls, attach it to it's background then to the front layer . Next make the flowers with a small flower punch, attach the self-adhesive pearls, then attach them below the bird with mini pop dots. Then attach the front layer to the base and enjoy!